"People are always blaming their circumstances for what they are. I don't believe in circumstances. The people who get on in this world are the people who get up and look for the circumstances they want, and, if they can't find them, make them." How could he have been so stupid! It's his hotel and he's messed up again. Basil Fawlty (of the classic BBC sitcom Fawlty Towers) decides to apologize to a long-suffering guest about some stupid misunderstanding. He bounds up the hotel stairs, frantically repeating over and over to himself by way of contrite rehearsal, "I'm so sorry, I made a mistake! I'm so sorry, I made a mistake!" Almost breathless, he knocks on the bewildered guest's door, and it opens gingerly. "I'm so sorry," booms Fawlty, "...err, my...wife has made a mistake!" Basil just couldn't bring himself to admit liability (although I don't think he'd have dared blame his wife had she actually been present). But can we blame society? People growl intermittently about the current 'blame culture'. And it's true the word 'accident' is sometimes mistakenly used in place of 'potential payout'. Don't blame me! I'm just saying, is all. It used to be the case that plain bad luck or an 'act of God' was something you just had to live with. We rarely hear: "It was nobody's fault...just bad luck." "Well, Bad Luck better get himself a fine lawyer, because I'm suing!!" Of course, sometimes an organization or individual really was woefully, even fatally, negligent; in which case, just blame and compensation are right and proper. Terrible life-threatening mistakes are made sometimes. But on a more day-to-day level, I think it's true that passing the buck is now a cultural pastime. This is a big problem if finding blame becomes more important than finding ways to put things right. But what's so attractive about the international pastime of blaming others? We all like simple causes; they neaten life's uncertainties. The ancient Egyptians saw the sun disappear every night and wondered, quite naturally, where it was off to. Until they 'solved' the problem. Our great fiery ball was swallowed up by the sky goddess Nut (or Nuit) each evening, who then gave birth to it each morning in the east. Okay, that's explained; now we can all relax. You see, any explanation is better than no explanation. 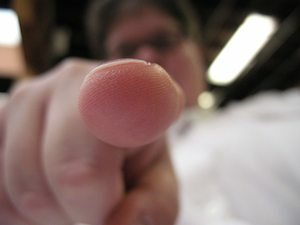 Finding someone to blame (and then blaming them) may give us a substitute sensation for having solved a problem when we haven't really understood cause and effect at all. Sure, anger and self-righteousness are exciting feelings, but we mustn't become so hooked on excitement that we stop being able to see more subtle shades of cause and effect. And let's not forget (as Basil Fawlty didn't) that blaming others is a neat little way of letting ourselves off the hook. We might say we want truth, but can we handle it? Some people get emotional satisfaction from talking about how awful other people are. But research has found that when you talk negatively to, say, a friend about how awful a colleague is, the listening friend is more likely to associate the negativity to you rather than to the person you're describing (1). Researchers call this 'spontaneous trait transference'. So it's best to go easy on bad-mouthing others because it may backfire anyway. It takes a big person to accept outwardly and inwardly that they screwed up. I'm not saying we should never blame other people. Sometimes others are at fault and they need to know it and take responsibility. But being able to accept responsibility when that's right means we actually become less helpless and passive. If everything is someone else's fault, then what part do I play in my own life? Are my actions entirely without consequence? Am I that powerless? Or do all my actions only lead to good outcomes? Am I an entirely new type of human being? Knowing we can accept responsibility when things go wrong means we can also accept credit when things go well. We do, as individuals, have an effect on life; and that's a good thing. But we need to develop the capacity to be objective enough about ourselves to avoid assuming we could never possibly have created problems ourselves. We also need to distinguish between accepting responsibility and punishing ourselves unduly. It seems we need to tread a path between overly internalizing ("Everything is always my fault!") and overly externalizing ("Why do other people always screw up!") when bad things happen. Doing too much of either make us off-balance and unhappy. Having the 'everything and anything I do is self-justifiably wonderful and right!' type of attitude is okay if you're two, but I'm guessing you're not. And the fact is, we all need feedback about ourselves. Otherwise, we don't move forward. The pill can be bitter to swallow sometimes, but it can do us an awful lot of good. Jesters or 'jokers' were the only ones in medieval courts who were allowed to point out to the King or Queen when they made mistakes. The pill was coated with sugar, but at least the monarch had a chance to maintain humility and perspective to govern and live more effectively. We can be our own 'jesters'. Blaming doesn't have to mean 'punishing'. If you are big enough to realize when you have made a mistake, you can admit it and then find ways, if possible, to make things better. That's all it takes and all you can do. If other people use it as an excuse to turn on you, then that's their issue. If you feel you have a tendency to blame others unfairly, then I salute you because you've already become your own Jester and everyone needs one. Most people will refuse to even countenance the idea that they may be prone to unfairly blaming others. So you've already taken a massive step. If something doesn't work out, it's easy to get creative and find some reason why it's someone else's fault. Learn to relax with not actually knowing for a while why something worked out the way it did. Tolerate the temporary uncertainty of just not knowing until you get a wider perspective on things. Jumping to blame the first person isn't an effective way of going about things. Wait for a bit by telling yourself: "Okay, this is the situation at the moment. Now, what's the very best thing I can now do in these circumstances...?" Seeing objectively where you went wrong is how you improve and develop. We don't progress as human beings just by 'learning to love ourselves' unconditionally. We need to develop the capacity to respond to the feedback life gives us about ourselves free of either the distorting effects of low self-esteem or conceit and arrogance. There is absolutely no shame in being able to admit to yourself or others that you made mistakes. Quite the opposite; it shows real strength of character. Very clever people make 'stupid mistakes' - it is part of being human. The only genuine way not to make mistakes is not to be in the world. How do you react when things go wrong? Do you feel a sense of shock, a sense of "how can this happen to me?" Do you find yourself getting angry and worked up? Do you immediately start casting about in your mind to identify someone to blame for the problem? And working out a string of epithets to fling at them before you've even clearly established what exactly has happened? If you are used to just dishing out the blame and not accepting your part, remember the research that shows being able to apologize in relationships makes them much more likely to last and thrive (2). Don't always be too quick to blame yourself, but just now and then admit to co-workers or your partner or friend that, yes, you too are human and you made a mistake. People will respect you for it. Ever noticed how some people get more hung up on assigning blame than actually fixing a problem? If people feel you blame them unfairly, they will resent you. They may even come to hate you. People instinctively hate injustice. Get used to saying out loud: "Okay, it happened! For the time being, we need to focus on making things better!" You can give people feedback later, once you've calmed down and if it's necessary. What may have led to those mistakes. How to do things better in future. Calling someone an idiot or telling them they "always do everything wrong!" is not feedback; it's just abuse, no matter why you think you're doing it. This kind of emotional incontinence may make people anxious, but they'll never respect you because it displays your weaknesses so clearly. As the wise Roman emperor Marcus Aurelius said, "How much more grievous are the consequences of anger than the causes of it." Life is full of people who take emotional shortcuts and blame other people unfairly or aggressively; for the sake of the human race, don't be one of them. But I wouldn't blame you if you were. Is your negative thinking making life harder than it needs to be? Click here to get my free video series on overcoming negativity sent straight to your email inbox that you can use right away to feel better. If you'd like some extra help around Stop Blaming Other People (and why it will help you) my company Uncommon Knowledge provides a huge library of hypnosis sessions through Hypnosis Downloads.com. I have helped create all the sessions there and have listed related downloads below. Please let me know in the comments section below how you get on. Do You Have an Inferiority Complex? The American Psychological Association published a study about the 'boomerang effect of gossip'. It turns out that when you say something - for instance, "He's a selfish, mean jerk" or "Her husband is cheating on her because she's an icicle in bed" - your listener often attributes those qualities to you. A survey conducted in San Francisco found that people who stay happily married are twice as likely to be able and willing to apologize to their partners as divorced or single people are. The survey found happily married people are 25% more likely to apologize first, even if they only feel partially to blame. The harder divorced and single people found it ever to apologize or make conciliatory gestures, the more likely they were to stay single.